The most versatile 2 tonne four wheel drive compact dumper with Powerswivel skip. Totally enclosed multi-plate oil immersed brakes. Thwaites' Kinglink chassis for superior stability and traction. 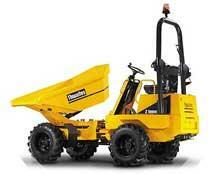 This dumper would be suited to sites where space is an issue and will fit onto a standard 3 ton plant trailer.